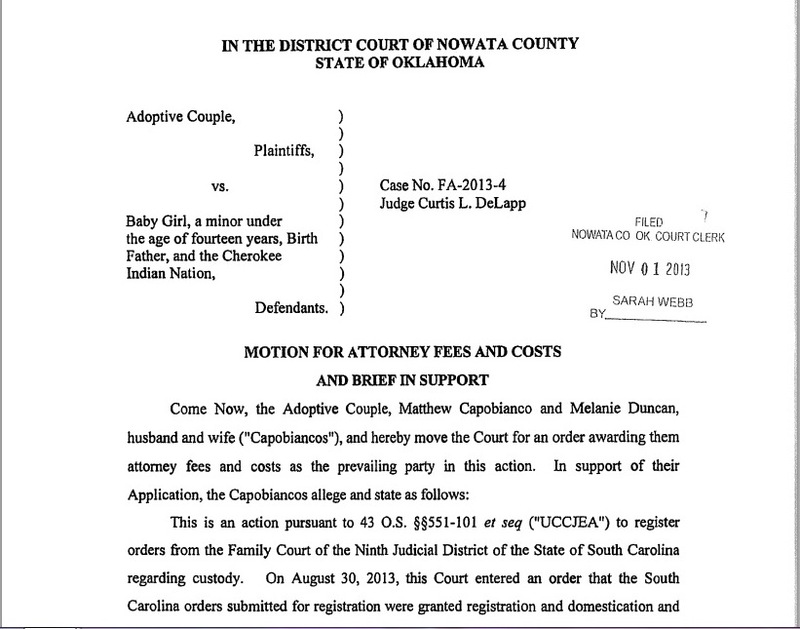 Adoptive Couple (Capobianco) vs. Baby Girl | hello, just trying to heal, here! I saw this today and became outraged, all over again! Was it enough for this adoptive couple, Melanie Duncan and Matthew Capobianco, to steal a little girl, Veronica, away from her father, Dusten Brown, and steal her away from her heritage, the Cherokee Nation? Obviously not. I’d been hearing rumblings of a lawsuit to be brought against Dusten Brown and the Cherokee Nation since the decision was made to turn Veronica back over to the Capobiancos. Now, it is no longer a rumble or a rumor. It is now a court order filed in the District Court of Nowata County in the State of Oklahoma on November 1 of this year. The first to be named as a defendant? Their own adoptive daughter. Who sues a 4-year-old, much less their “own” child? Who does that??? Matthew Capobianco and Melanie Duncan, that’s who. I don’t know how the laws in Oklahoma work, but can a minor child under the age of 14 be held financially responsible for someone else’s decision to adopt her? And where does her share of the money come from? There is nowhere else to look but to her future. If, in order to file a suit against Veronica’s father, they had to stay consistent with the naming of the case in the original motion to get her back after the courts had awarded her true and natural father custody of his true and natural daughter, how does anyone with true parental instincts see the motion with their own eyes, right there in front of them, in black and white, and allow themselves to go through with suing their own daughter – if indeed that is who and what she is to them? I question that because this motion makes me wonder: Is she family or is she property to them? Please tell the people, Matthew Capobianco and Melanie Duncan, what are we supposed to think? Oh, wait. You did tell us. It’s right there in your court document, readily available for public consumption. You made your intentions known in a court order for any and all to see who you are and what you are about. You named your own adoptive daughter as a defendant in a case you brought against her, her father, and her tribe. You did that – not the media, not the rumor mill, YOU. YOU are named as the plaintiffs. Instead of parenting the now traumatized daughter (or have you even had time to notice that) you fought so hard to adopt and raise, this is how you choose to spend your time and resources? Yeah, you live in a free country, and you’re free to do as you wish, but you certainly won’t be getting my vote for the Parents of the Year award. Sick, despicable people. Just more ammunition against them in the future, when that child grows up and realizes what raised her- sick, narcissists.